The Antarctic vortex is a whirling dervish that extends from the stratosphere to the deep ocean. Inside the steep gradients that drive this circulation everything is reflected inward and contained. Outside the dervish everything that contacts it receives angular momentum. Thus works a centrifugal pump. One very important feature of our planet that gets accelerated by the Antarctic pump is the thermohaline circulation. Here it is drawn with a linear acceleration into the Pacific and then doubling back in a helical figure 8 to reinforce the surface warm water pile up at Indonesia (the Pacific Warm Pool) that sets the stage for an El Nino. I would draw it looping further into the north Pacific. The water would rise and warm in South China Sea and reinforce the Kuroshio Current. This is the PDO “positive” phase. Positive in the sense that it reinforces El Ninos. Cool water is pumped to the South China Sea where it reduces evaporation and rainfall in China. El Ninos are more frequent because the warm water surface flow reinforces the efforts of the trade winds to pile warm water at the restriction of Indonesia. But like the loose end of a fire hose this thermohaline configuration is unstable. We got Rossby waves, we got Kelvin waves, we got maybe waves we can’t imagine bouncing around the ocean basins. Bouncing off continents, bouncing off midocean ridges, running up and down the continental margins, even pumping surges of water through sieves like Indonesia and the Bearing straight. And then we get a sleeper wave, a resonance of all these waves so strong tha it unwinds the helix and the firehose flops to the other side of the Pacific. 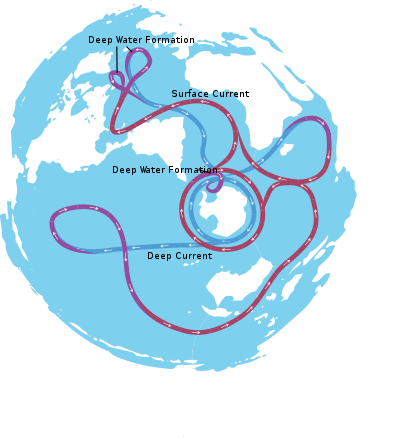 Now the thermohaline circulation reinforces the Humboldt Current. The Southern Hemisphere trade winds are strengthened. Cold upwelling cools the eastward surges of warm water that would be El Ninos as the Northern Hemisphere trades move more to the central Pacific. And the male children are aborted. The last sleeper wave was in 1997 and the most recent abortion was this very year. This entry was posted in Climate, Climate Change, Geography, Oceanography and tagged El Niño-Southern Oscillation, el nino, Humboldt Current, Kuroshio Current, pacific decadal oscillation, Pacific Warm Pool. Bookmark the permalink.